Upsala is a beautiful example of Federal architecture. Across the street from Cliveden is Upsala, one of the finest examples of Federal architecture in Germantown. Dirck Jansen owned the land before 1775. The older, back part of the house was built around 1740. John Johnson Sr. is said to have bought the land in 1766. There is speculation over whether father or son owned the house first. 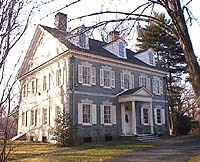 John Johnson III, inherited the property in 1797 and built the front section of the house. The house has been partially restored inside. The staircase to the third floor is particularly graceful and seemingly unsupported. There are splendid wooden mantels, delicately carved and faced with Pennsylvania marble. The rooms contain Sheraton, Hepplewhite, Philadelphia, and English furniture. Most of all, there is a sense of the past.